The 'New California' Expansion for 'Fallout: The Board Game' brings you new adventures and challenges in sunny, irradiated California. Two new scenarios await you, including five new detailed miniatures and plenty of game material. To keep everything safe and tidy in the box, we have the matching foam set for you. The set fits exactly into the original board game box of the expansion 'New California' (ZX03) for 'Fallout: The Board Game'. 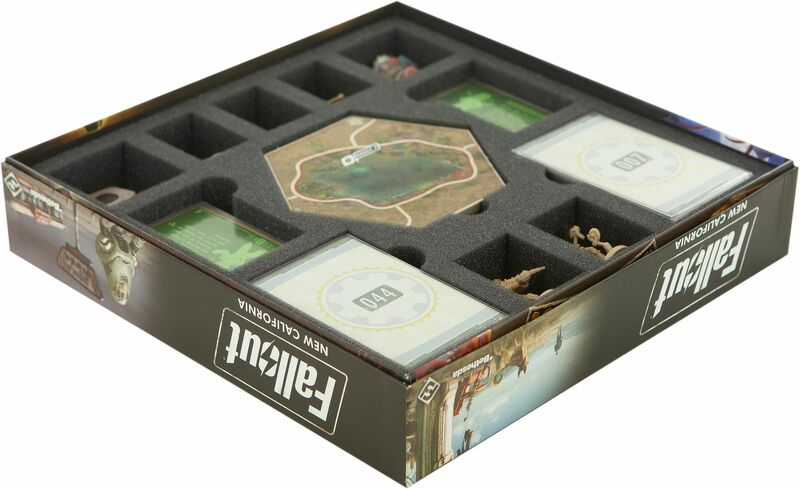 The foam insert with 12 compartments individually tailored to game material and miniatures keeps your box tidy. Five of them accomodate the companions. These are located here separately from each other in precisely fitting compartments. This protects sensitive details, avoids collisions and preserves painted miniatures from rubbing or chipping of colors. A large hexagonal pocket in the middle is reserved for the map tiles. 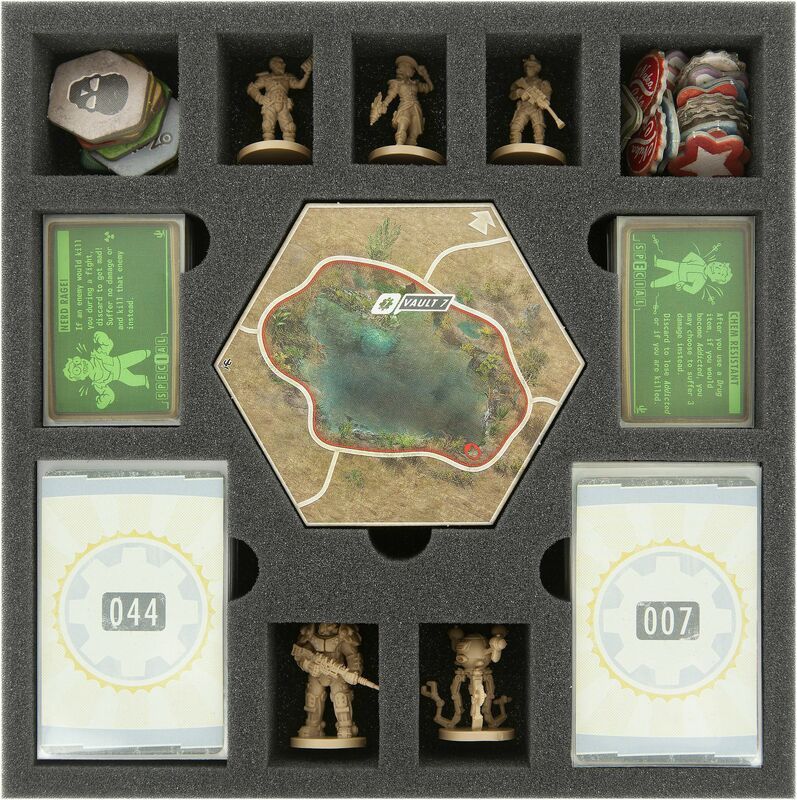 Tokens and quest markers can be sorted into two compartments. The large game cards, such as Encounter and Quest Cards, get just like the small cards, 2 card slots each. They are all provided with finger-wide recesses for easier removal and are of course also suitable for cards with sleeves. Thanks to the clear storage of the game materials, you can keep track at all times, save time when setting up the game and no small S.P.E.C.I.A.L. token gets lost. A matching foam topper completes the all-round care of the Fallout: New California game box. The 6 character cards and the rulesheet are placed on this. This way all miniatures are safely stored, the game material is neatly stowed away and the contents of your box, even on the bumpiest paths to the next game, are optimally protected. 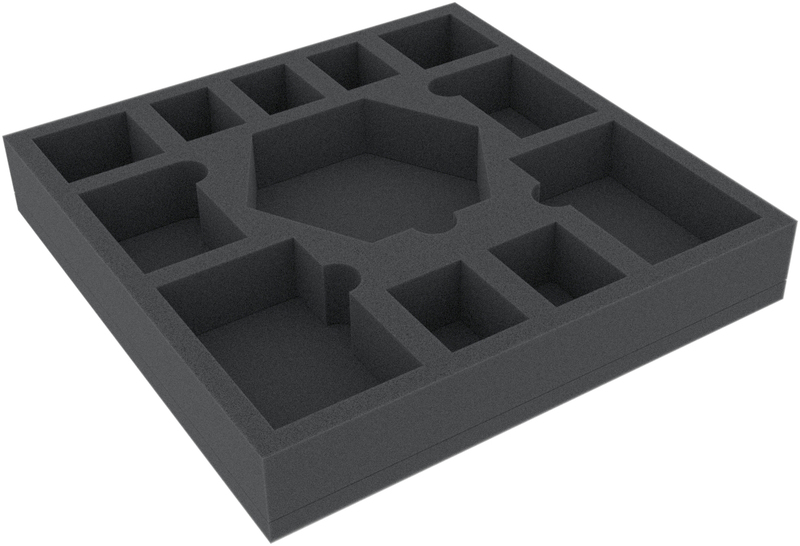 The foam tray has the dimensions: 247 mm x 247 mm x 40 mm total height (30 mm usable height + 10 mm foam base).